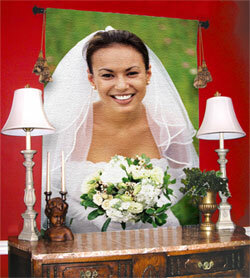 Any photo can be used to create an heirloom quality gift. Stunning colors and gorgeous detail in warm luxurious cotton. The possibilities are unlimited! Remembering cherished events like births or weddings, graduations precious memories or loving family, friends and even your pets. Our full color Woven Photo Throws are made of 100% cotton in a large 54" x 70" size is our most popular item in this product line. These throws make perfect housewarming gifts. Perfect for curling up on the sofa or as a cozy bed cover. A warm and welcome addition to any home! Woven Photo Pillows are a perfect accompaniment to the Woven Photo Throw. Made of 100% cotton and a generous 17" x17" size. 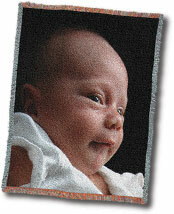 Create a Woven Photo Wall hanging of your most cherished moments! These are made of 100% cotton and show amazing detail! They are available in small (26" x 34") and large sizes (53" x 40") and include the basic rod and mounting kit. 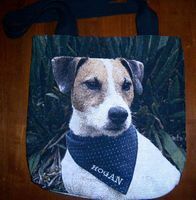 Our Woven Photo Tote Bags are fully lined with photo on both sides. 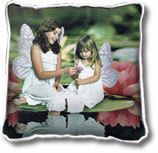 They are a 100% Jacquard woven cotton, study construction 17" square. How long will it take? Please plan on 4-6 weeks to receive your woven heirloom. Often it is much faster but it depends on the time of year. How many people/pets/buildings can I have in my photo? You can have as many as you wish but the more subjects the smaller the details will be for each of them. We generally recommend no more than 5 subjects in the larger items and 1 to 3 subjects for the smaller items. Are these products printed? No, these items are jacquard woven, 100% cotton and will never fade even after repeated washings. Are these products washable? Yes they are machine washable. We recommend cold water in a gentle cycle and tumble drying at the lowest setting. Make sure the photo is in focus. The better the focus the better the final piece will be. Your subject should take up 60-80% of the photo. The more detail and colors will be more vibrant and true-to-live. For digital photographs please use at least a 2 megapixel camera or higher. Send the photo as a JPEG with no compression. Old photos can be used but can be faded or have changed color over time. Black and White photos can be used.